BEES WASPS or HORNETS. WHAT’S BUZZING YOU? There are lots of flying insects out and about in our gardens, fields and other open areas and they are all busy at work fulfilling nature’s directives. So, since we humans are also frequenting these same places it’s important for us to steer clear of these busy creatures because some of them will sting if you invade their space. Beware! Being stung is no picnic and can ruin your day! Here is a short lesson in identification and some important facts. Bees are fuzzy pollen collectors that almost always die shortly after stinging people (the stinger becomes embedded in the skin, which prevents multiple stings). Bees don’t always die each time they sting, though; the primary purpose of the stinger is to sting other bees, which doesn’t result in the loss of the stinger. A bee can generally only sting you once and her death is assured. The problem with explaining the difference between wasps and hornets is complicated in that, according to most definitions of wasps, all hornets are wasps. Wasps are members of the family Vespidae, which includes yellow jackets and hornets. Wasps generally have two pairs of wings and are definitely not fuzzy. Only the females have stingers, but they can sting people repeatedly. Yellow jackets are sometimes confused with bees because they look very similar. With a black and yellow body, it’s difficult to tell the difference between the two at first glance. Yellow jackets are a type of predatory wasp that are part of the genera Dolichovespula and Vespula. Most are black and yellow, but some, like the bald-faced hornet, are black and white and all the females have stingers. is now widespread on the East Coast of the U.S. Like other wasps, hornets can be extremely aggressive and can sting multiple times. Bees and wasps have different types of stingers, which affects the amount of venom that they can inject in a single sting. Wasps have smooth stingers, which allow them to sting a perceived threat, multiple times. Wasps in general are more aggressive than bees (excluding “Killer Bees”) and will sting more than once. Honeybees have barbed stingers that dig into the skin, remaining embedded as the bee flies away. Not all bees have barbed stingers. For example, the bumblebee’s stinger is smooth, allowing them to sting multiple times, just like wasps. Bees and wasps inject different amounts of venom per sting. A honeybee, who can only sting one time, injects as much as 50 micrograms of venom in a single sting. As the stinger is embedded in the skin, it continually pumps this venom into the body, so the sooner you remove the stinger, the less venom it injects. It typically takes about 45-60 seconds for the full amount of venom to be released. A wasp injects a significantly smaller amount per sting — only 2 to 15 micrograms — but can do so more than once in a short period of time. 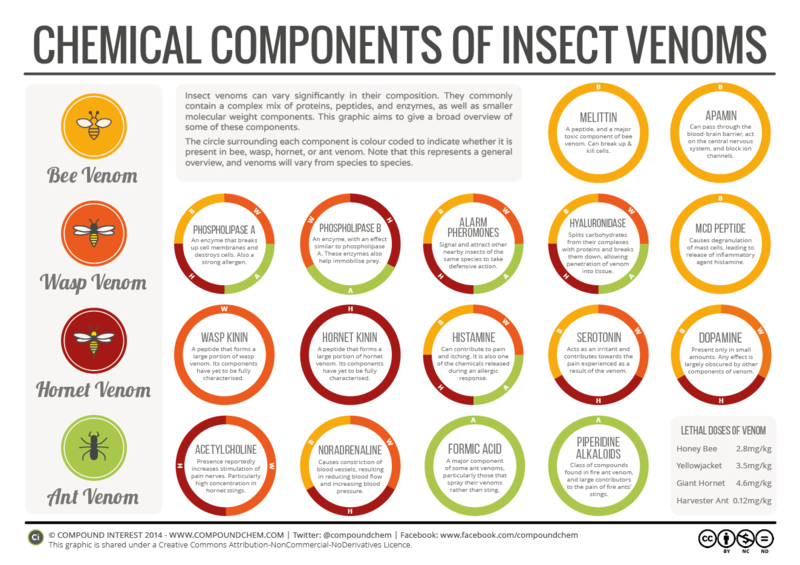 The chemical composition of bee and wasp venom are different but, they produce similar side effects. Both types of venom make your body release histamine, which causes symptoms like those of a mild allergic reaction: itching, swelling, redness and pain at the sting site. Because the venom typically makes the site of the sting sore and achy, applying an ice pack can help dull the pain. The site may remain sore for several days as it heals. Different people have different reactions to bee and wasp venom. A person with a severe allergy may need immediate medical attention after a single honeybee sting, while a healthy person without a significant allergy can withstand 1,000 or more stings before reaching a lethal dose. If you don’t know whether you are allergic and you’ve been stung, watch out for the symptoms of an allergic reaction, which can develop immediately or within 30 minutes. They include difficulty breathing, hives that spread, facial swelling, chest tightness and difficulty breathing. These symptoms also can lead to loss of consciousness, so if you believe you may be experiencing this type of allergic reaction, contact emergency medical services immediately. Fun Fact: Bees stopped buzzing during the 2017 Total Solar Eclipse. on August 21, 2017, while millions of Americans took a break from their daily routines, to witness a total solar eclipse, a similar phenomenon was happening unnoticed nearby: Bees took a break from their daily work schedules, too. In a first time study of a solar eclipse’s influence on bee behavior, researchers at the University of Missouri organized a group of citizen scientists and elementary school classes in setting up sound monitoring stations to listen in on bees’ buzzing—or lack thereof—as the 2017 eclipse passed over. The results, published today in the Annals of the Entomological Society of America, were clear and consistent at locations across the country: Bees stopped flying (therefore buzzing) during the period of the total solar eclipse. A dragon bit me on my face”! Huckleberry Finn was an amature raft builder and river rafter, when compared to Red Imported Fire ants. As fire ants are flooded out of their underground nests, they hold onto each other for dear life, forming a fire ant flotilla that allows them to survive. Actually, they hold themselves together by linking mandibles (mouth parts) to the legs of other ants and locking leg to leg to mouth to leg. Instead of scattering, with every ant for him or herself, red imported fire ants (Solenopsis invicta) have the unique ability to gather together as a colony and form living rafts on the surface of rising flood waters. Their rafts are so tightly woven together, that water cannot penetrate the raft. This structure also holds a layer of air, called a plastron layer, tightly around the raft. The plastron layer (air bubble) facilitates buoyancy and keeps ants on the bottom of the raft (those underwater) alive. This unique “air bubble” and a waxy coating on their bodies allows these ants to stay afloat for weeks if necessary, so that they have a fighting chance to reach dry land and save their colony. To make sure the colony survives, the queens and their eggs (there can be one or more queens in a colony), are given the driest accommodations on the raft, near the center. The raft itself is in constant motion, with ants moving across the top and joining the stationary layer on the bottom. In this way the raft is kept in tip top condition. Scientists don’t really know why some ants get to be the bottom raft crew, but it seems that there is some indication that this is not a voluntary position. The colony must survive. So while floating down the river on natures currents, these ants are constantly searching for new and safe places to set up housekeeping. So, what do these ants do when they finally hit dry land? Abandon ship of course! All ashore that going ashore! The South American or Red Imported fire ant (Solenopsis invicta) was initially introduced into Southern California in 1998 (Orange County) and is a major concern as an invasive species. It is similar in general appearance to our native southern fire ant (S. xyloni), except the head and thorax of the red imported fire ant is a little darker and their dirt excavations for colony sites are much larger, almost the size of gopher mounds! The sting of both species of fire ant is about the same pain level, and leaves a raised reddish welt, especially in tender areas. A single bite or sting is not pleasant but watch out for a whole colony may decide to attack at once if a threat to the colony is perceived and this can be a definite health concern as they can inflict significant damage and a whole lot of fiery pain. With the amount of rain and snow, in California this year, and the extensive number of areas destroyed by fire, flooding is a major problem for we humans and animals alike. You can be sure, as we deal with disastrous flooding, Fire Ants will be industriously building rafts, and river rafting their way to safety and, like Christopher Colombus, new lands to colonize. Here’s a cartoons about fire ants. Want more? Click Here! Termites: From Wrecking Homes to Saving the Environment. According to the National Pest Management Association, termites cause more than $5 billion in property damage each year. They can eat wood and extract energy from it, thanks to a few thousand microbes living inside their gut. This huge community of microscopic organisms works together to digest the cellulose and lignin that give plant cell walls their strength. As a biproduct of this process, Methane (a natural gas) is expelled by the termites. So what does termite “gas”, have to do with producing clean energy for the world? A lot! Each termite produces, on average, about half a microgram of methane per day, an insignificant amount you say. Not really. When multiplied up by the world population of termites, their global methane emission is estimated to be about 20 million tons each year. Most methane is produced by decaying debris from natural sources such as wetlands, rivers and streams, gas hydra tes on the ocean floor, and melting permafrost. Termites are the second largest source of global methane emissions. Next comes the extraction and burning of fossil fuels for electricity and transportation. Then way down the list comes the cows. All of the above sources use variations of the same process, the decay of organic material in anaerobic conditions (in the absence of oxygen). Symbioticgel micro-organisms in the digestive tracts of termites (flaU.S. Department of Energy Office of Sciencelate protozoa in lower termites and bacteria in higher termites) produce methane gas (CH4). How can coal be a food source for termites? It’s not really. Scientists have figured out a way to use the termites gut microbes to break down cellulose which is a big part of what makes up coal, converting the coal into methane gas, giving us a cleaner fuel source. According to University of Delaware researchers, Termites may hold the key to processing coal — a big polluting member of our Earthly energy supply — into cleaner energy for the world, products for agriculture, water cleanup and waste recycling. Mining coal and processing it, by traditional means, is a pollution nightmare. Coal is a fossil fuel created from the remains of plants that lived and died about 100 to 400 million years ago. Basically, it’s wood that’s been literally baked for millions of years. According to Pradad Dhurjati, a professor at the University of Delaware, in the Chemical and Bio-molecular department; “This groundbreaking biotechnology has the potential to change ‘dirty coal’ into ‘clean coal’. That would be a big win-win for the environment and for the economy.” Right now, the process is taking place in large vats of termite gut microbes, but scientists are looking forward to introducing these microbes directly into coal seams deep beneath the Earth’s surface, letting these hungry organisms, mine and process the coal, in place, and then sending the natural gas, in a steady flow to the surface for consumption. This is not the end all solution to the clean energy problem. It is the goal of scientists to perfect this process until new and more efficient renewable energy sources can be found and made economically feasible. Who are the most successful beings on Earth? It certainly isn’t Man, Ape or any other mammal. The most successful animals on the planet are the arthropods. They have conquered land, sea and air, and make up over three-fourths of all currently known living and fossil organisms. They are the true masters of the Earth! The Phylum Arthropoda got its name from the Greek, arthros (jointed) and poda (foot) and encompasses over 800,000 species, including arachnids (spiders), crustaceans (sea creatures) and insects. Also, members of this gigantic phylum are Myriapods; centipedes, millipedes, sea spiders, and maybe a host of other organisms yet unidentified. What do all of these creepy, crawly and flighty creatures have in common? They are all invertebrate (without a backbone), have symmetrical, segmented bodies, jointed legs, exterior skeletons, a ventral (front) nervous system, highly developed sensory organs and they are cold blooded. Arthropods have a leg up on all other organsms. They do everything with legs or modified legs. They swim, crawl, jump, and fly, they use legs to sense with (their antennae), to bite and sting with and to chew with (they even chew sideways). All this and more, is done with legs. So, with segmented bodies that accommodate environmental changes, with legs that let them walk; with hard, waterproof shells that keep water in or out; and with highly adaptable respiratory systems, arthropods have dominated the animal world. Arthropods occur in virtually every earthly habitat, from the cold ocean depths to the hottest deserts. They can live through extremes that would kill most vertebrates. Arthropods crawled onto land about 100 million years before vertebrates did. It’s thought that colonizing land was easier for them for several reasons – including the fact that they had already evolved legs, which they used for walking on the bottom of the sea. About 80% of all animal species are arthropods! All arthropods undergo metamorphosis – a process where their bodies change radically as they pass from their larval to adult stages. Butterflies are the best-known for entering cocoons as caterpillars and coming out quite different, but all arthropods do something similar! When arthropods outgrow their old exoskeleton, they molt – leaving behind their former skin and growing a new one. All arthropods do this at least once in their lives. Crustaceans and arachnids – two types of arthropods – have blue blood instead of red blood! Their blood uses a blue copper compound to carry oxygen, instead of the red iron compound used by most other animals. An Arthropods’ hard exoskeleton is made of chitin – which is made of a sugar glucose compound! It’s not sweet but it sure is hard! There’s nothing like the smell of an evergreen tree and a cozy wood fire, to get you in the holiday spirit. But when you bring a live or cut Christmas tree indoors, along with the necessary firewood, some of the insects t hat have called your Christmas tree and yule log, home, might be joining you for the holiday season. commercial settings are u sually inspected and cleaned. The emphasis here is on usually. The greatest threat of home invasion comes to those who cut down their own trees. It is a known fact that as soon as a tree is cut from its trunk and brought into someone’s warm home, most hitchhiking critters die from starvation or desiccation (lack of water). It’s also a known fact that some may begin to wander from the tree, or firewood pile , in search of food and water sources and if these are found they may start to set up housekeeping. Don’t be afraid to purchase a real tree because of the possibility of tiny pests. And don’t forego the warmth and cozy atmosphere of a wood fire either. Control methods are relatively simple and low maintenance. And remember, artificial trees can house pests, too. Spiders Spin a Web of Fear! Spiders and their webs are synonymous with Halloween. Spider lore has changed over time. According to medieval superstition, people believed that if you saw a spider on all hallows eve, it was the spirit of a dead loved one watching over you. When humanity started the witch hunt era, spiders became associated with magic, witches and the supernatural, right along with bats and black cats. They also become representatives of danger, fear, ensnarement, and deception (think of the phrase “caught in a web of lies”). Their odd anatomy and physiology (multip le eyes, crushing mandibles, 8 legs, and bulbous abdomen) creates aversion and fear in some individuals. Add in their habit of seeking out cracks and crevices to hide in, their skittering and jumping movements and their nocturnal foraging activity, not to mention their ability to create great sticky webs, and what you have is the basis for “arachnophobia”, or the fear of spiders. So now that we are convinced that spiders are loathsome creatures, our imaginations add magnitudes of size and deadliness, making them truly Halloween icons. The true nature of spiders isn’t to be scary. But if you are perceived to be scary, then nobody messes with you, hence you may live longer. Spiders have acquired a bad reputation over the centuries. Going from lucky charms to fearsome, evil specters. What they really are, are natures clean-up crew. Spiders eat other insects. Their diet consists mostly, of flies, roaches, moths, earwigs, aphids, caterpillars and even pesky mosquitoes. Some of these delicacies, spread disease, so spiders help humanity stay healthy. While we fa ntasize spiders into huge, deadly, horror creatures, remember they are also the inspiration for a much beloved super-hero, Spider Man. You may be noticing more spiders out and about. It’s Fall, otherwise known as Autumn, and this is the time of year when many male spiders are out searching for a mate. This is true for house spiders and garden spiders, alike. If you are seeing more spiders inside your home, they may have came in from the cold, but more likely that they have been hiding in your wall voids all summer, venturing out, now into your living areas looking for mates. Once they mate, chances are, the males will die and the females will go back into hiding, lay their eggs and then, you know, “die”. Need help dealing with your spiders? Follow this link: Get Rid of Spiders!